Roulette presents an evening of works dating back to 1986 and world premieres by experimental composer + multi-instrumentalist Fast Forward. The evening will consist of solo works for bicycle handlebars and steel pan (performed by Fast Forward), ensemble works for guitar, voice and percussion, an ensemble work for two trombones and two percussionists, and a New York premiere for quartet. Fast Forward is a New York based composer / musician who makes music with almost anything. He toured extensively with the Merce Cunningham Dance Company under the musical direction of Takehisa Kosugi from 1995-2011, as well as directing and performing in Robert Ashley’s legendary opera That Morning Thing at The Kitchen. 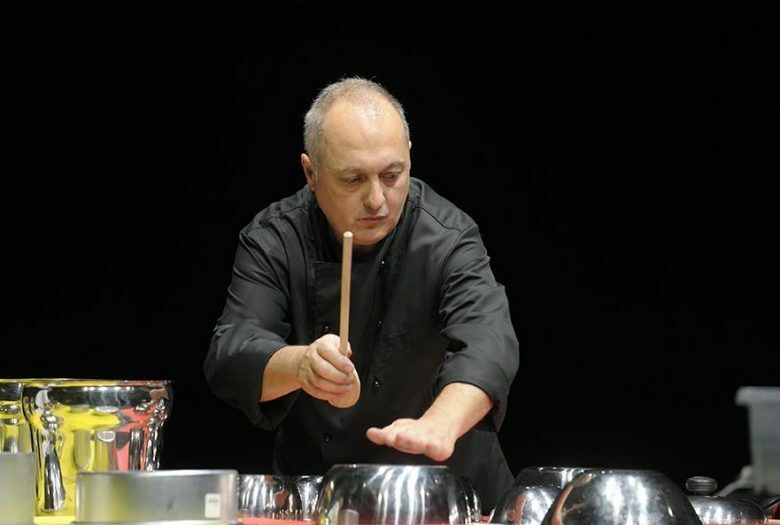 He composes large scale music-theatre works for diverse instrumentation, such as Feeding Frenzy, a culinary concert for multiple musicians, cooks, waiters, and the audience, most recently performed in Hong Kong, Norway, Sweden and Lithuania. Covalent Bond, a collaboration with Miami filmmaker Barron Sherer utilizes a custom made “pool table” of a 100 gallon tank of water in which instruments are played on the surface of the water. Trommelfeuer for 8 musicians was performed at Hamburger Bahnhof in Berlin in 1989 before the demolition of the Berlin Wall.